Southwestern Hummus Dip - 2 ingredient homemade black bean hummus topped with sour cream, cheese, tomatoes, olives and cilantro. Add some green chiles to the hummus for a kick! I took this to a party and everyone loved it. Even the hummus, black bean and sour cream haters raved about this simple dip. Ready in 5 minutes!! Can't beat that! 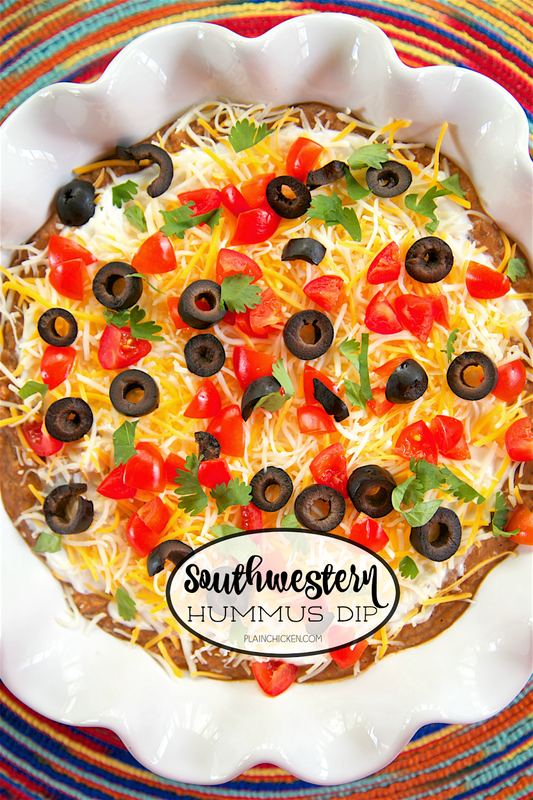 This Southwestern Hummus Dip is a new favorite. I took it to a party and everyone loved it! Even the hummus, black bean and sour cream haters loved it! Seriously! It is CRAZY good and it only took about 5 minutes to make. Can't beat that! I made this earlier in the day and refrigerated it until we went to the party. 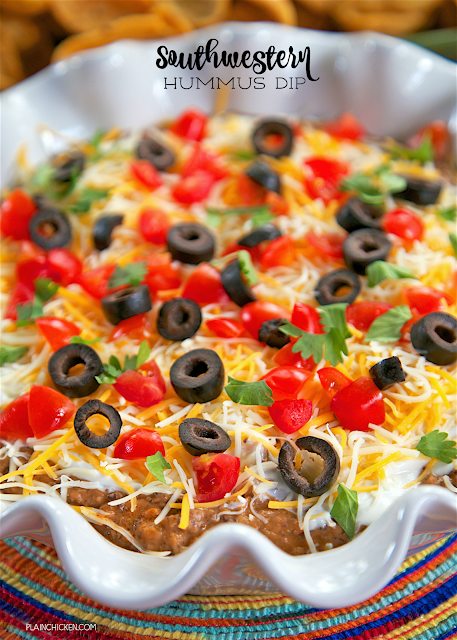 We served the dip with some corn chips, but tortilla chips or celery sticks would be great too! Feel free to change up the veggie toppings on this Southwestern Hummus Dip. I used tomatoes, olives and cilantro. I think onions, green olives and bell peppers would be delicious too. Get creative! This Southwestern Hummus Dip starts with a quick homemade hummus. 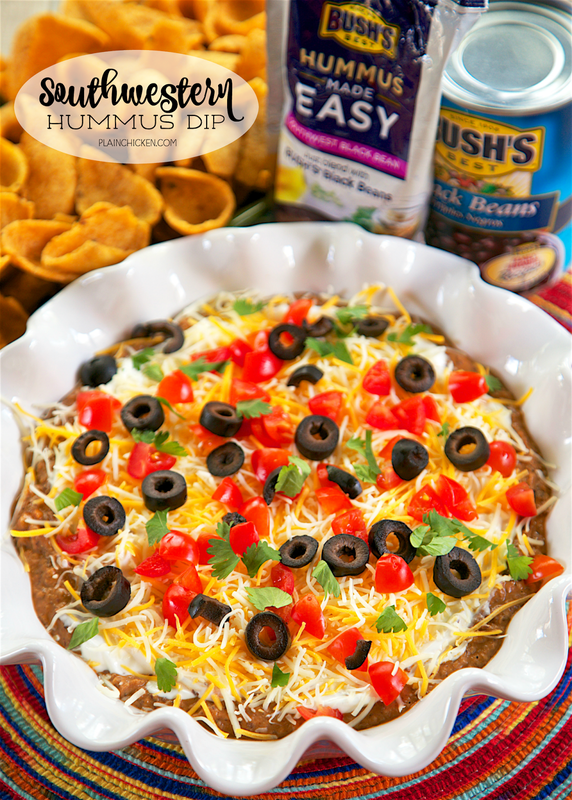 I used the new BUSH’S® Southwest Black Bean Hummus Made Easy and BUSH'S® Black Beans. Have you seen the new Bush's Hummus Made Easy packs? I saw them on my last grocery trip. They are right next to the BUSH’S® Beans. 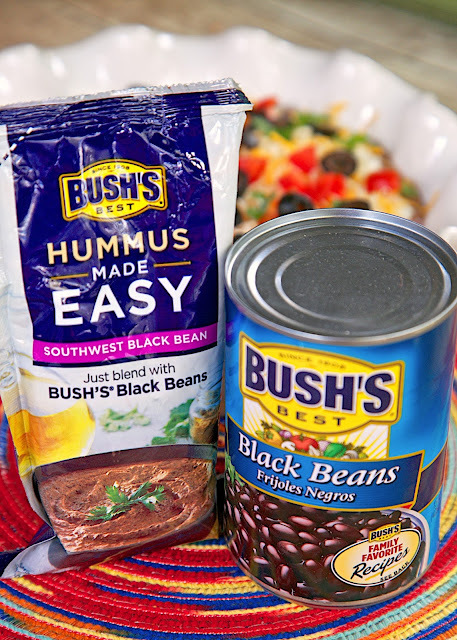 I immediately added the BUSH'S® Hummus Made Easy and a can of BUSH'S® Black Beans to my buggy. I love hummus, but I never make it at home. I guess I think it is too expensive to buy all the ingredients. I love that BUSH'S took care of everything for me. It only took about a minute to whip up the homemade hummus. I rinsed the beans, threw them in the food processor, added the BUSH'S® Hummus Made Easy packet and blended it together. Freshly made hummus on demand! The BUSH’S® Hummus Made Easy is so simple to customize the flavors to your taste. I added a can of green chiles to the black bean hummus. I wanted a little kick to the dip. Once the hummus was made, I spread it out in a pie plate and layered the remaining dip ingredients on top. SO simple and SOOOOO good! BUSH'S has two other Hummus Made Easy pouch - Classic and Roasted Red Pepper. I can't wait to try them! My favorite thing about these new Hummus Made Easy pouch is that they are so easy to customize. The add-in possibilities are endless. You can also use any BUSH'S Beans - garbanzo beans, black beans, pinto beans, you get the idea. SO many ways to make it your own! Combine the BUSH'S Black Bean, BUSH'S Southwest Black Bean Hummus Made Easy and green chiles to the food processor. Blend until desired consistency. Spread hummus into the bottom of a 9-inch pie plate. Spread sour cream over hummus. Top sour cream with cheese, tomatoes, olives and cilantro. Serve or refrigerate up to 1 one day. Serve with chips or veggies. I eat hummus with crackers. I eat my Hummus on whole grain chips. I love Hummus because it is so healthy and delicious! Alway hummus with baby carrots...this dip looks delicious! I am usually a roasted red pepper hummus kind of gal, but this sounds delicious!! I love eating my hummus with fresh veggies and pita chips. I also love putting hummus on a turkey wrap with loads of veggies! I have to try Bush's roasted red pepper hummus! I love hummus with veggies or crackers. I eat mine with pretzels sticks-yum! I add hummus as a topping to my salad. I enjoy hummus with toasted pita chips. My favorite way to eat hummus is with homemade pita chips, they are so easy to make. I just cut them up, brush with a bit of olive oil, season with whatever I have a taste for that day and bake! I eat hummus as a spread for bread. I usually just eat it on pita chips. I eat hummus on whole wheat crackers. As a dip for my carrots or on gluten free crackers. I eat hummus with pita chips, soft pita or multi-grain chips. I have never tried hummus before but this dip looks really good. I eat hummus with toasted pita bread or veggies. I love dipping fresh veggies in hummus! I eat my hummus with Stacy's Simply Naked Pita Chips. I enjoy hummus as a dip, usually with tortilla chips. Your recipe sounds really great. I eat my hummus smeared on a pita sandwich or with veggies.This sw dip recipe looks amazing btw. I like to eat hummus on toasted pita with kalamata olives. I like to spread hummus on pita bread before adding other sandwich fillings like grilled chicken and onions. I cut pita bread into wedges to eat with my hummus. I like my hummus with bagel chips and/or raw veggies. I love using it on my falafel wraps with warm falafel, organic leafy boston lettuce, a warm whole grain wrap, and lots of fresh hummus! I have actually never tried hummus before! This review, though, has peaked my interest! I eat hummus mostly with a combination of celery stalks and cheese. I love hummus on turkey sandwiches, with vegetables or pretzels. I like to put hummus on top of pasta - oh yum!